We planned to keep the sun on our backs. In terms of preparation, we have had to be innoculated with a number of jags. H1N1 Swine Flu, Rabies, Japanese Encephalitus, Hepatitus A & B, Typhoid, Diphtheria, Tetanus, Polio. You cannot be vaccinated against Malaria or Dengue fever, so it’s a daily Doxycycline prophylactic tablet and taking preventative measures to try and avoid being bitten. Oh Yeh ! Gingers also have to wear large sombrero’s to avoid sunburn and sunstroke. 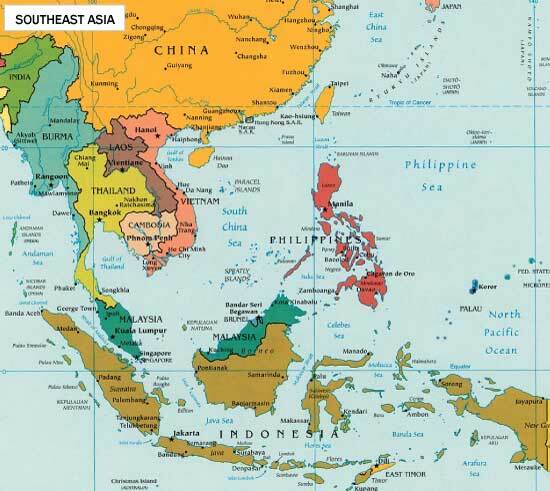 So far, we have covered the West coast of Malaysia, Sumatra, Java, Bali and Lombok, Indonesia, Singapore, Myanmar (Burma), North & Central Thailand, Cambodia, Vietnam, Laos but ran out of time to cover East Malaysia, Southern Thailand, The Philippines and China. The good thing is, these places will always be there, and we will look forward to visiting them some time in the future.